……..there’s always something to do. For those that like to score hills off their list, Cowal has plenty within its reach. 4 Corbetts ( hills between 2500 and 3000 feet high, with at least 500 feet of descent on all sides) , 10 Grahams (between 2000 and 2500 feet high, with at least 500 feet of descent on all sides), 10 Sub2000’s (that rise at least 500 feet above their surrounding land). Of course,there are plenty of unclassified hills that can be as rewarding as the bigger ones. Trig points are another place worth visiting. Most giving great views,not quite sure on the exact amount of the ‘Pillar’ type there are in the area, but there is at least 30+ ,varying in build material and condition. Lower level walks.From a mile to marathon there’s a maze of forestry roads and tracks to be explored. The forestry commision have created many trails at Glenbranter, Pucks Glen,Ardentinny and Bishops Glen,Dunoon to name a few. Each offering a different view at every turn. Secluded beaches…..Cowal has these too. Oh, almost forgot, The Cowal Way ! Whether it’s fast paced A road cycle clocking up the miles on the A815 and taking in the vistas of Loch Eck, or a more strenuous cycle over the A8003 to Tighnabruaich enjoying the views over the Kyles of Bute. A tour on the quieter B, C and unclassified roads as they twist, turn, climb and fall visiting more rural areas and enjoying a meal at one of the outlying eateries. For the more adventurous , the network of forestry roads and trails give an endless choice. Make up your own route on the established roads and tracks or choose something from what the forestry commission have on offer. For the ultimate experience, ‘Bikepacking ‘ is a must. Load up and hit the open road. From a single night to a multiple night tour, staying at accommodation of your choice. Cowal has a variety of options from Hotels, Inns, Lodges, B & B’s and guest houses. For those wanting total freedom a spot of ‘ wildcamping’ could be in order. Whatever your choice, the rest will be well deserved!! Another thing that Cowal is not short of……water. From isolated inland fresh water Lochs, tidal sea lochs and the open water of the Firth of Clyde there’s no shortage of paddling locations. 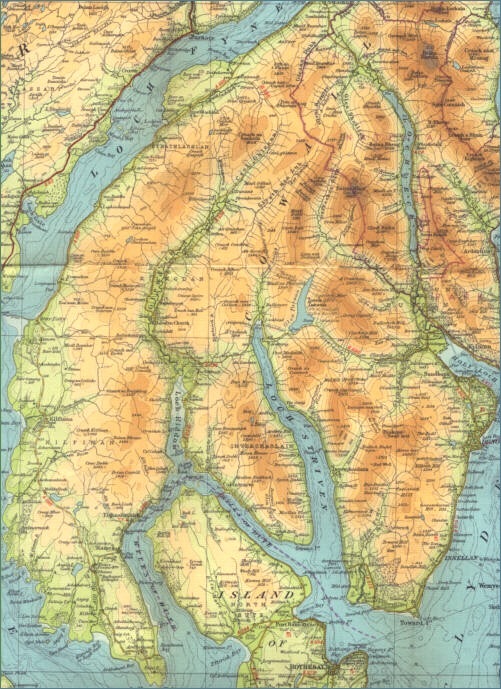 Cowal’s coastline extends from Cairndow to Arrochar an approximate distance of 135 miles. Paddling this coast gives such a different perspective, allowing you to see and access some fantastic remote places. Lochs such as Fyne, Ruel,Riddon, Striven, Holy,Long, Goil not forgetting the pass round the north end of Bute, The Kyles of Bute are a paddlers paradise. Cowal being so coastal means you have access to accommodation, places to eat or stock up on supplies as you tour the shorelines. Inland there’s Loch Tarsan and Loch Eck, both with stunning backdrops. On a calm day there’s no where else to be than coasting along taking in the scenery, stopping for a coffee along the way. ‘Take nothing but pictures leave nothing but footprints, kill nothing but time’.